Is the Fatbike revolution here? I’ve been hearing the term for a few seasons now and I remember seeing one for the first time back in 2010. In a word, although I thought they were interesting with their giant clown-like tires, I also thought they were ‘ridiculous’. I wondered why anyone would want to ride a bike so cumbersome and heavy? Through my ‘racing’ lens, the bikes made about as much sense to me as a unicycle or a Penny Farthing – sure they might be unique and fun to mess around on, but really, what’s the point beyond that? I was perfectly happy to leave what I considered the Fatbike fad, to others. Well, three seasons later, that fad continues to grow and enter the alternate term ‘Snowbike’. 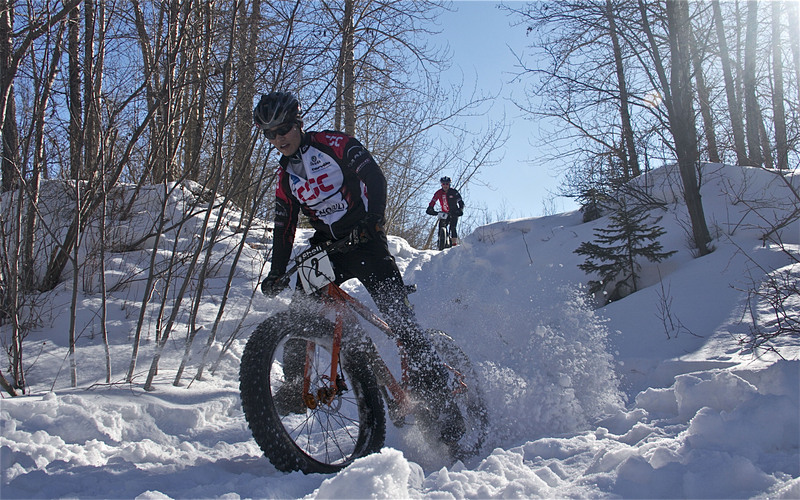 Suddenly, there is a die-hard ‘Snowbike’ group ride here in the city, comprised of a growing number of dedicated Fatbike owners who know just how much fun these bikes are, and how well these bikes perform in our winter conditions. There are now so many locals marauding around on these machines left over from the set of Mad Max, that just this past weekend, the Devon Bicycle Association hosted the first ever, dedicated Fatbike category race! So, now I wonder, do I think this is still just a fad or is it the beginning of a legitimately new category – am I going to be adding a Fatbike/Snowbike to my quiver soon? Well if I did want to pick one up, apparently I had better get in line. Despite several major bike brands now offering a Fatbike option, like Surly, 9:Zero:7, and Salsa, here in Edmonton, you can’t find a Fatbike to buy. The shops are sold out, and backordered… I’ll admit this news shocked me a bit. 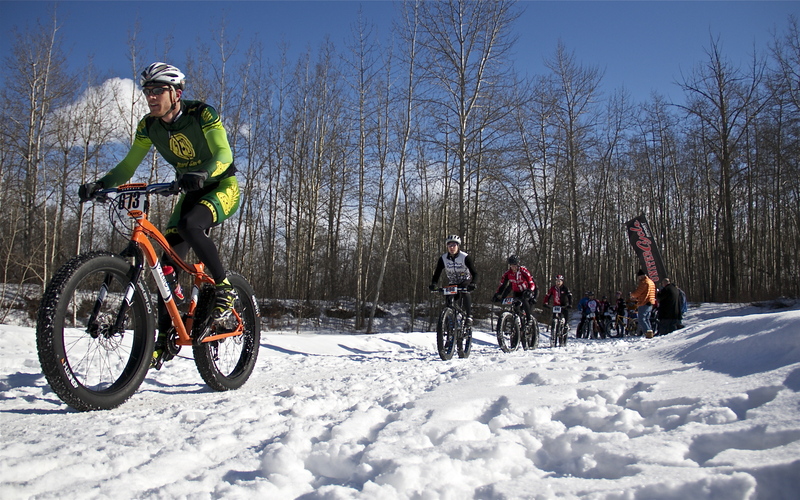 I stuck around after my race on the weekend, to watch history in the making with Alberta’s first-ever, official, Fatbike race and it was a pretty legit field and one that I think could continue to grow. That said, it will be interesting to me to see what happens in the summer. Sure, there were lots of Fatbike racers at the Blizzard Bike Race, but most of them are regular MTB racers in the summer, so unless the Fatbike becomes a new channel for attracting an entirely new group of riders and racers, I wonder if the Fatbike won’t remain a fun winter activity for most. Time will tell, but what’s your take? Thanks very much to the Devon Bicycle Association, and to the event sponsors – congratulations on a very successful 2nd annual Blizzard Bike Race! Looking forward to 2014. Who knows, I may just have to sign up for the Fatbike cat. My fatbike is now my favourite bike. It’s a hoot even in the summer. Once you have the right gear (fat bike, clothing, etc), riding in the winter is SO much fun, it’s hard to believe nobody thought of this sooner. Since we reached a critical mass of fat bikers on our Sunday rides, the routes have been ever more soft snowy singletrack, and those without the fat tires get destroyed trying to keep up, and quickly realize they’re a tool, not a fad. As more and more people in climates like ours realize how much fun winter riding can be, I predict everyone who is of the type to have multiple bikes for road, mtb, or cross, will also get a fat bike. They’re sold out for a reason, and this is just the beginning. I have been riding true fatbikes since 2005 and before that I had some MTBs with 3 inch tires and 44mm rims shoehorned in to them. I love riding bikes on snow, and I only got interested in racing on dirt after racing on snow. In many cases they are the best bikes for non-snow applications. I use mine pretty regularly for bikepacking and other rides where I suspect there will be sand, gravel or other loose surfaces. I am pretty new to the fatbike world and admittedly, did not really know why people would want to ride these bikes – until I rode one. Lets look at the data – in most of Alberta there are at most 5 months of snowless mountain biking to be had. The rest is perfect for fatbikes. Yup, I’ll admit that I’m interested in them, especially if they help make riding outside in the winter more accessible and fun. There is simply no substitute for getting outside on the bike.